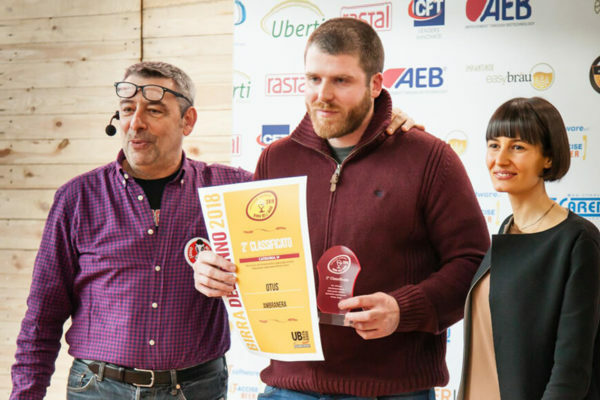 Best Beer of the Year is the most important brewing contest that is held every February at Beer Attraction, the international exhibition in Rimini dedicated to craft beers. This year 279 craft breweries took part; they were evaluated by 84 international judges, that valued 1650 beers (300 more than last year). They decided the three best beers for each category (41 in total). AMBRANERA, the new oatmeal Stout by Otus (first production) placed itself second in the category of English-inspired stout, Porter Stout. Otus is greatly satisfied and the team was visibly excited. A quality certificate invites the brewery to continue research, since it is the first time Otus takes part in Beer Attraction. It was really a success at first try. “We wanted to share our passion for this profession, by allowing our products to be evaluated by important experts of the sector”, declared Alessandro Reali, the brewmaster who created AMBRANERA. Here all the 2018 winners from different categories of “best beer of the year”.